Originally established in 1837 by the Parisian Thierry Hermes, Hermes has evolved from a brand that excelled in constructing handcrafted leather and leather good, into one of the global leaders of contemporary luxury fashion accessories and timepieces. Since the 1950's, the designers at Hermes have expand their expertise into the world of timepieces, quickly becoming renowned in the world of fashion, not only for their signature orange boxes, but also for their confident and exquisite designs. 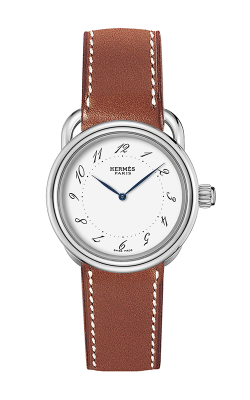 Still as committed today to the quality that has defined them for nearly 200 years, the watches by Hermes are unique in the way that they combine classic French construction and craftsmanship, with innovative contemporary designs, creating pieces that make for truly one-of-a-kind timekeeping experiences. Why Buy Hermes Watches from Merry Richards Jewelers? In Oakbrook Terrace, Merry Richards Jewelers has been the first name in luxury quality timepieces, engagement rings, wedding bands, and fine jewelry including, necklaces, earrings, bracelets, and fashion rings, since they opened their doors in 1985. As a family-owned and operated business, the staff at Merry Richards Jewelers is proud to bring unparalleled customer service to the Chicagoland area, in addition to an ever-expanding inventory of contemporary jewelry pieces by some of today's top designers including, Tacori, Simon G., Michele Watches, Piaget watches, and many others. Additionally, Merry Richards offers a number of services to ensure the utmost in satisfaction from their customers, including sensible layaway and financing plans, an amazing lifetime diamond upgrade program, as well as free cleaning, polishing, inspection, and appraisal on all items sold. The team at Merry Richards Jewelers is proud to bring their Oakbrook Terrace neighbors, the most recent collections and styles available from the master watchmakers at Hermes. Popular collections of Hermes watches available at Merry Richards Jewelers include, those of the timeless and legendary equestrian-inspired collections, such as the understated Slim collections. 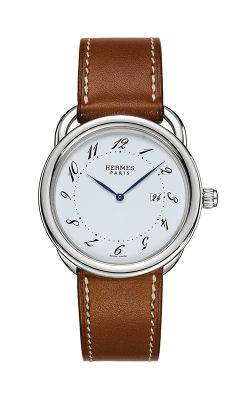 Further, for individuals looking for a timepiece that makes a bold and distinctive statement, Hermes offers a number of uniquely constructed pieces from their Heure H and Medor collections, the extraordinary Hermes PM 028326WW00, in addition to the H Hour Hermes PM 036721WW00 which confidently displays the "H" that has come to define Hermes.